Anna shared her personal story of challenge and triumph with Wounded Warrior Project®. Anna and Jessica Daubenmire shared their common struggles as female warriors in an interview with WWP. JACKSONVILLE, Fla. - Their service doesn't come without sacrifice. So many members of the military have injuries you can see, but others have injuries you cannot. A Jacksonville Army veteran is one of the thousands of warriors living with invisible wounds of war, and she's now sharing her silent struggle in the hopes of spreading the message that it's okay to reach out for help. Anna Moreira wanted to honor her family the one way she knew how: join the military. One Of The Brave: Anna Moreira calls PTSD a "scary and silent beast." "My grandfather, his dream was to see his last name on a military uniform and he passed away with that not being fulfilled," she told News4Jax. "I wanted to fulfill that for him." 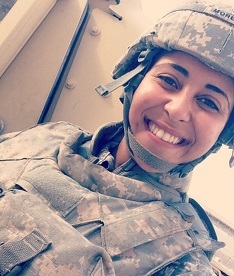 Moreira signed up with the U.S. Army to serve her country and honor her grandfather's wishes. But what the Army specialist didn't expect, was a life-changing discovery just before she was scheduled to deploy to Kuwait. "Three weeks prior to deploying, my roommate and best friend, was suffering with PTSD as well, and she ended up taking her life. I found her and it kind of went downhill from there," Moreira said. "I didn't know how to deal with it, seeing someone you love so much alive one day and then the next day completely gone in front of you." She did go on to deploy with her unit for a purpose; much like she had joined the military to honor her grandfather, she would now deploy to honor her fellow comrade who had taken her own life. "I knew she wanted to go on that deployment. And I knew that she had her reasons for serving as well. And I wanted to honor her and everyone else who went before me as well who went through worse things than me and strapped on their boots and served," she explained. Moreira left the Army in 2014, struggling in silence and ignoring her symptoms of post-traumatic stress. Anna decided managing her PTSD was worth the fight. "PTSD is a very scary and silent beast," she said. "I got really bad into addiction and I tried to take my own life." Moreira says there were weeks where she wouldn't leave her house and wouldn’t associate with anyone. "I didn't even walk outside to walk my dog, I just stayed inside the house. I was miserable," she admitted. But hope and healing finally came for Moreira when she learned about the mental health programs offered by Wounded Warrior Project. "It saved me," she said. "I learned coping skills, and that I didn't need to abuse medication to deal with my struggles." The Army veteran has taken part in numerous WWP mental health workshops and other empowering events with other local veterans who have similar stories and similar wounds. She is publicly sharing her struggle with PTSD today in the hopes of encouraging others who still struggle in silence. Today, Anna wants to make sure her fellow wounded veterans honor themselves by seeking the help they need. "Most people don't know how to deal with or talk about it. They are afraid to come out and seek help because of the stigma of being misunderstood or crazy and unreliable. My message is, it's okay to seek help," she explained to News4Jax. "You are not alone. You can overcome it, you can learn to live with it, and deal with it." On Veteran's Day, a day the country honors and pays tribute to those who have served, Moreira wants to make sure those who are suffering remember to honor themselves. She wants to make sure they know they can get help and support from organizations like Wounded Warrior Project. "If someone is struggling with PTSD and they are afraid and they don't know how to reach out or what to do, It's okay. It's scary, It's very scary. It’s scary to have to face your fears and traumas. But the only way you'll learn to live instead of survive, is if you talk about it, open up, and allow yourself to heal." Wounded Warrior Project estimates 400,000 service members and veterans are living with the invisible wounds of war, which include PTSD, major depression and traumatic brain injuries. For information on how the nonprofit can help you, go to woundedwarriorproject.org or call 877-TEAM-WWP (832-6997).